Natural linen made from the best flax grown in northern France and Belgium. Linen is a wonderful option for a soft and warm feel in winter while cool and fresh in summer. 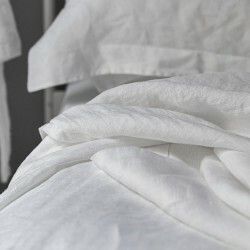 The natural properties of linen are healthy for the skin and perfect for those with allergies. Flat sheet, made from pure linen, white. Flat sheet, made from pure linen, white. If anything characterises our range of linen bedding it would be the quality and softness. The Connie Home linen duvet cover has a simple, elegant look that will give your bedroom a natural, luxurious look. This duvet cover can adapt to whatever setting, whether that’s hot or cold. It keeps you fresh and cool in the summer and warm and snug during the winter months. The pure white colour contributes greatly to the natural, neutral look of your bed, making your bedroom bright and cheerful. With a barely visible button style closure at one end, making the linen duvet cover adapt nicely to the shape of your duvet filling. Available across a variety of sizes, single, double, king and super king allowing you to select the appropriate duvet cover for your mattress. Comfortable and soft the Atlanta duvet cover will contribute to your enjoyment of a great night’s sleep enveloped in luxury linen bedding. One thing is guaranteed and that is the really high quality of our linen bedding and in particular our flat sheets made from 100% natural, washed linen. These sheets are made from a beautiful linen fabric which is very soft and smooth, this considerably boosts your chances of a great night’s sleep. Another of the advantages of linen is that this material does not need any special attention when washing, making life a lot easier. Over time the Atlanta range of linen flat sheets become even softer and still stay strong. The quality of our linen bedding can be contributed to the fact that they are 100% natural and free of any synthetic materials. 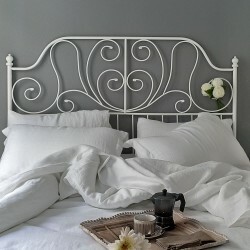 This is observed in the softness of the linen rather than a rigid feel which is found in man-made textiles. Available in all the usual sizes to match your mattress, you will appreciate for many years to come the elegant and luxurious touch that our linen flat sheets give to your bedroom. If you are looking to create a simple, yet distinctive effect to the styling of your bedroom, then it’s worth checking out our range of classic linen pillowcases. Made from 100% natural, washed linen sourced from only the highest quality fibres. Throughout history people have been using linen as their ideal bedding material precisely because of it’s softness and durability. The Atlanta classic linen pillowcases are simple, pure white and without any decorative borders. 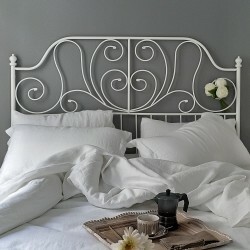 Allowing you to rest peacefully and gives your bedroom a bright, pure and clean look. The closure is a standard envelope style system and fits snuggly against the pillow insert. One of the main benefits of our classic linen pillowcases is that they are appropriate for all types of skin. This is because linen is a completely natural material and free of bugs, while also absorbing any humidity in the air. Which all contributes to a healthier sleeping environment. Regardless of the seasons, our classic linen pillowcases are the ideal solution all year round. Linen has the ability to keep you warm in the winter and nice and cool in the summer months. With all the collections from Connie Home we include the option for an Oxford pillowcase. These decorative pillowcases are characterised by having a 5cm border around each edge. Within our Atlanta linen collection the Oxford pillowcases have a standard undecorated border, giving them a stylish natural look. Being a lightweight material which adapts to your body temperature, the linen pillowcases Oxford style are a great way to enjoy a relaxing night’s sleep. The organic fibres of linen are derived from 100% natural linen which is hypoallergenic and free of dyes and man-made materials. Our pillowcases are not only soft and comfortable to start with, but over time and even after frequent washing, they become even softer without losing any of their strength. The white colour of our Oxford linen pillowcases will give your bedroom a subtle elegant touch, creating an air of natural sophistication.